It is almost my birthday! During birthday week I get to dine on whatever I wish. It includes all sorts of fare. No doubt I will be eating pizza and Chinese food. There is a particular dish of a Thai basil and eggplant that I especially love. Over the weekend John and I are going with my shared birthday buddy and his wife for a 2 night wine tasting, Pacific Ocean gazing, and gourmet dining extravaganza. Needless to say this is not a week that I am going to dine lightly or part-time vegan too successfully. I will post when I have something reasonable to post and otherwise, see you next week! On Monday even though it is birthday week I followed the vegan until 6 plan by having my morning gruel and a TJ’s quinoa cowboy burger on whole wheat English muffin with lettuce and tomato plus the remnants of the tabbouleh that I made a few days ago. 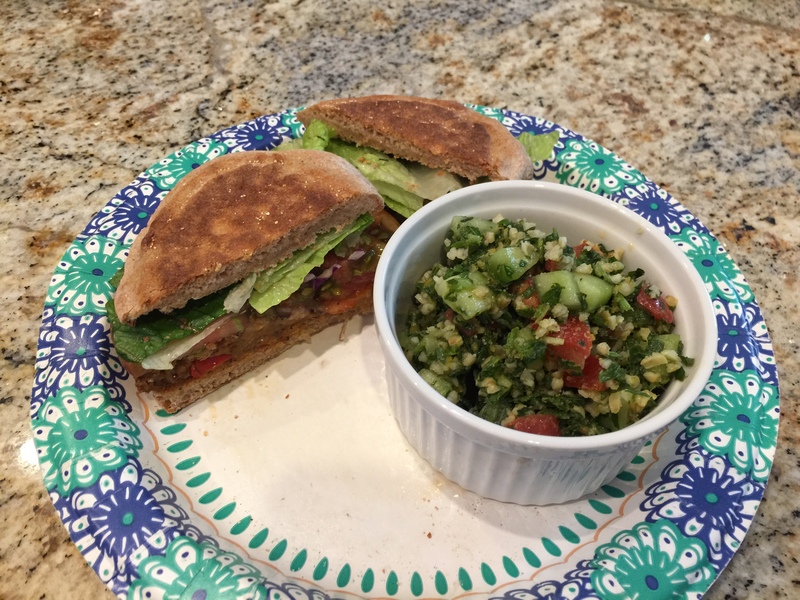 This entry was posted in Grains, Vegan, Vegetables, Vegetarian and tagged quinoa, tabbouleh. Bookmark the permalink.